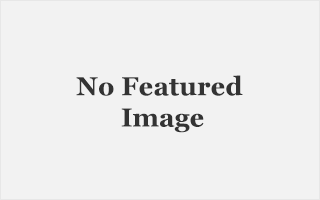 *This is a sponsored post and contains affiliate links. Hello Hello!!! 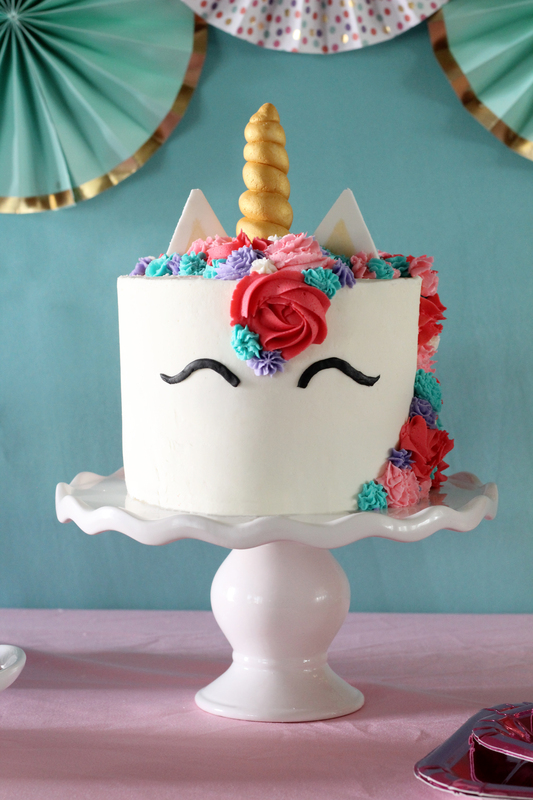 Today I am sharing this darling unicorn party!! I created the decor using my new Cricut Cuttlebug!! Have you heard or seen the Cuttlebug before? 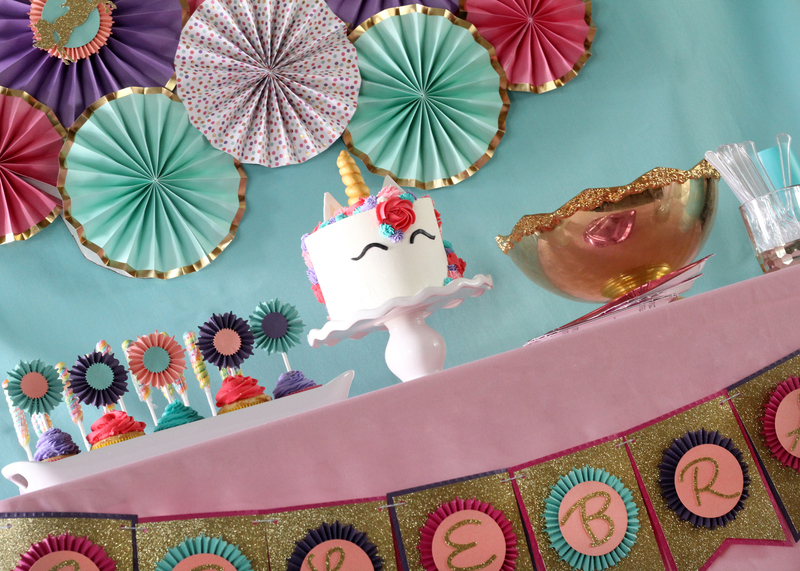 I am super excited to show you how to use the Cuttlebug and create this darling unicorn party!! Here is a list of some supplies you will need to order to create this party! Lets talk about the Cuttlebug first! Whats is it? The Cuttlebug is a die cutting machine. It is not electric. It is a hand crank but very easy to use! When you open up the machine it will suction to the table it is on to stay in place. 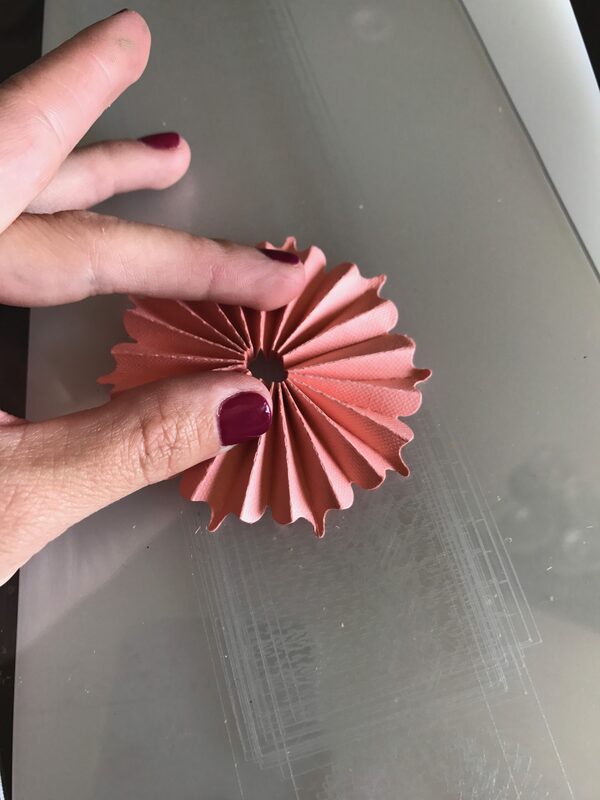 You will then place your material and die cuts or embossing folders on spacers like a sandwich and feed it through the machine as you crank the handle. The Cuttlebug will then either cut the shapes if you are using a die cut or emboss the paper adding texture and dimension to your project!! Its pretty cool! Another fun fact is that the Cuttle bug is easy enough to use with kids and they love to help cut out images for their own projects too. First start by cutting your 12×12 paper into 2″ strips. 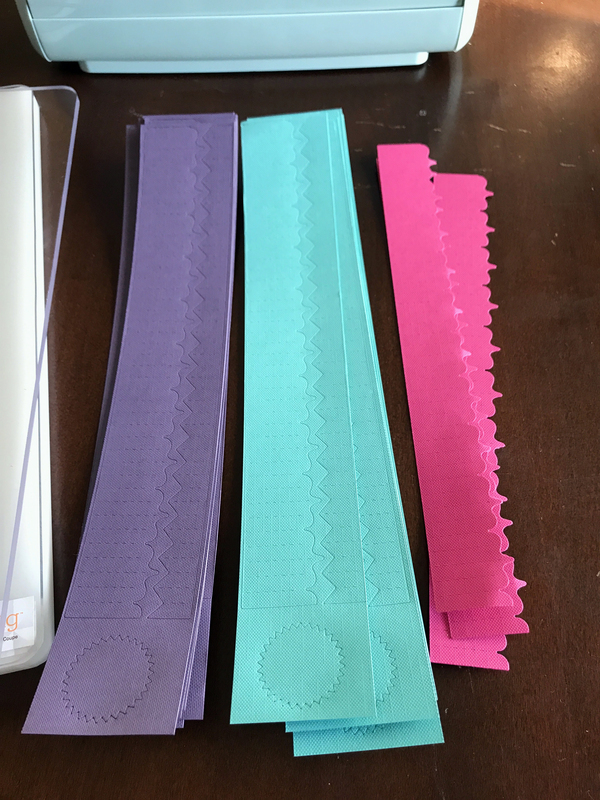 I like to use the Cricut paper crafting kits paper cutter. Makes it so fast and straight. Once you have your paper cut, place the piece of paper on the grey foam side of the pink crown rosette Like image 1. This is your die/scoring piece it looks weird. I wasn’t sure the first time if it was the die cut! Flip it over and place it on one of the B plates. Place that on top of the white A spacer. Like Image 2. Place the C plate on top of all of that to make a sandwich like image 3. Place the whole thing into the Cuttlebug and crank it through, Like image 4. You can then remove the paper and you will be left with this. Now you can pop that out. I used the larger one. 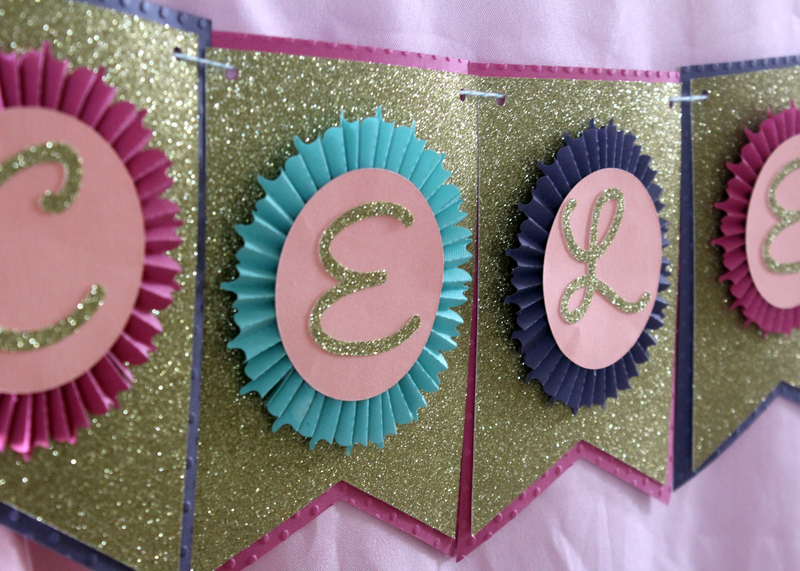 I made 2 strips for each of the rosettes on the banner. 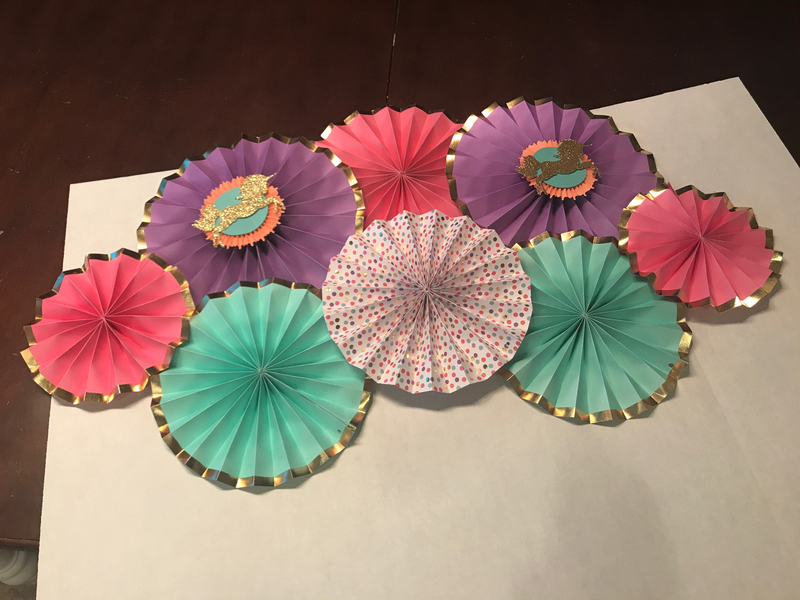 So you will need 18 strips total for the banner and 4 strips for the unicorn background rosettes and 1 strip per cupcake for the smaller rosettes. Fold the paper back and forth on the dotted lines to create an accordion. Glue 2 of the ends together to create 1 large strip with 2 pieces. Glue those 2 ends together now to create a circle. Press down the center of circle so it all comes together. *This is image is for the smaller cupcake rosette the banner will have a larger space left when you press it in. 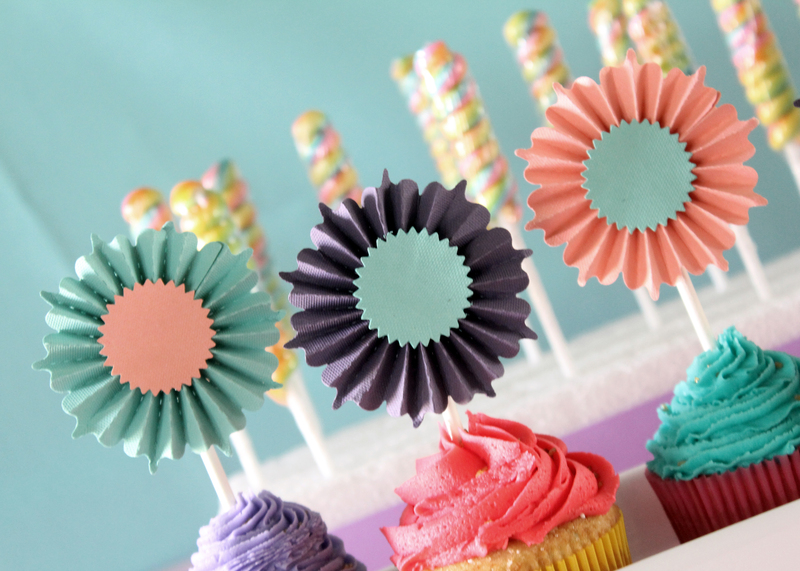 For the smaller cupcake rosettes use the small circle that was also cut out for the center. Place 2 glue dots on the back of the circle and attach it to the front of the rosette like pictured below. 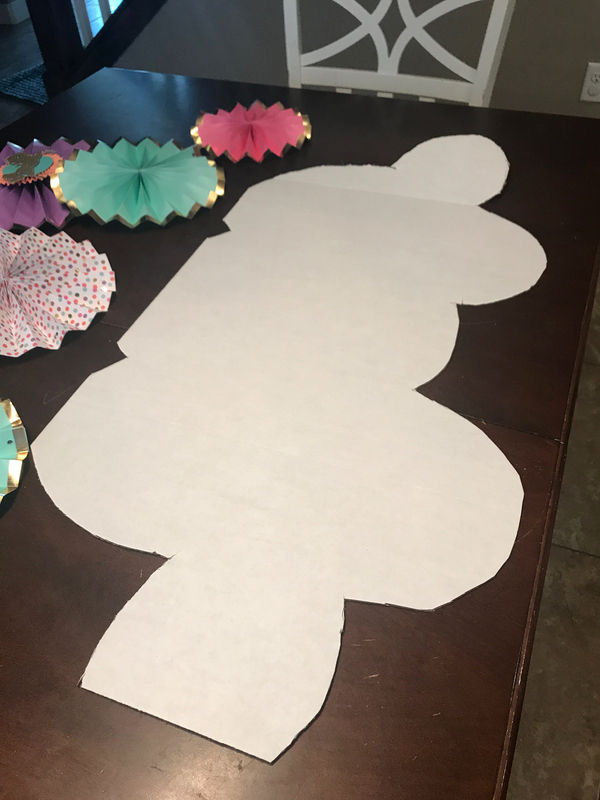 For the Larger Rosettes on the banner you will need to cut out a bigger circle to place on the center since we attached 2 strips for those ones. So lets move onto the Banner next. You will see in the project that there are 6 pink pennants, 3 purple pennants, 9 gold pennants (these are smaller made for layering!! ) 9 Circles, and the letters. Cut them out according to the colors you want them to be. After they are cut take the pink and purple ones and go back to your cuttle bug. This time you will be using the embossing folder. I wanted to give them some texture. Layer as follows..
Place them all in the Cuttle bug and crank it though. You will see that your paper now is embossed with the polka dots!! How fun is that!! Cricut offers tons of different embossing folders for you to use! 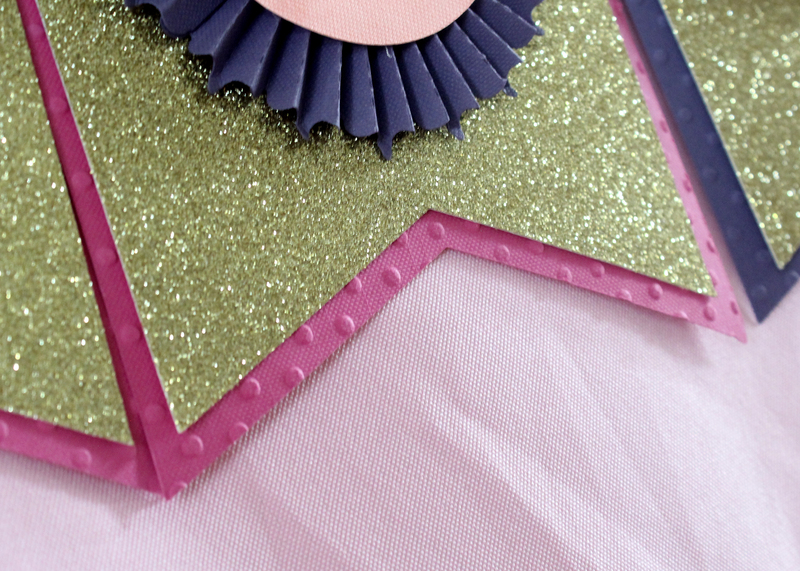 Get all the Rosettes that you made previously made. Glue the letters onto the circles and then use 3-4 glue dots to glue the circles to the front of the rosettes. Using a hole punch, punch out 2 holes on each top end of each pennant. thread your bakers twine or whatever string you want through each hole and hang in front of your table. The large rosettes on the backdrop were purchased from target. 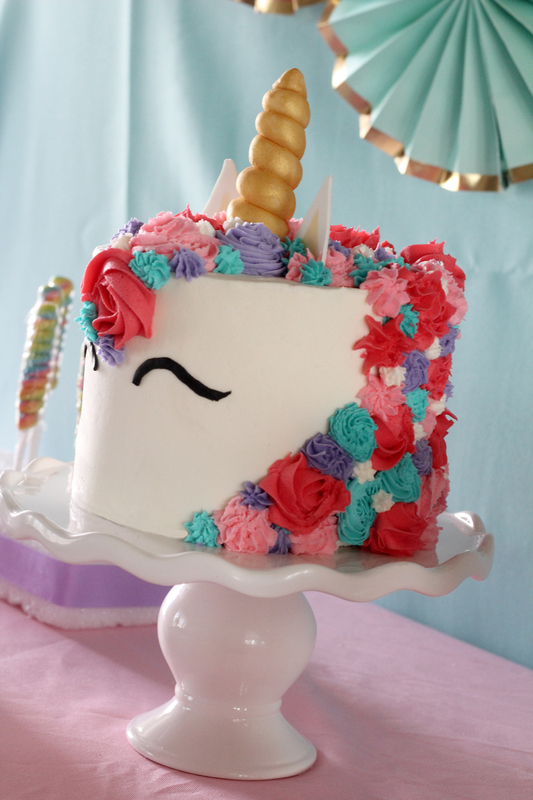 I added the smaller rosettes with the unicorns on them to personalize it to my party. 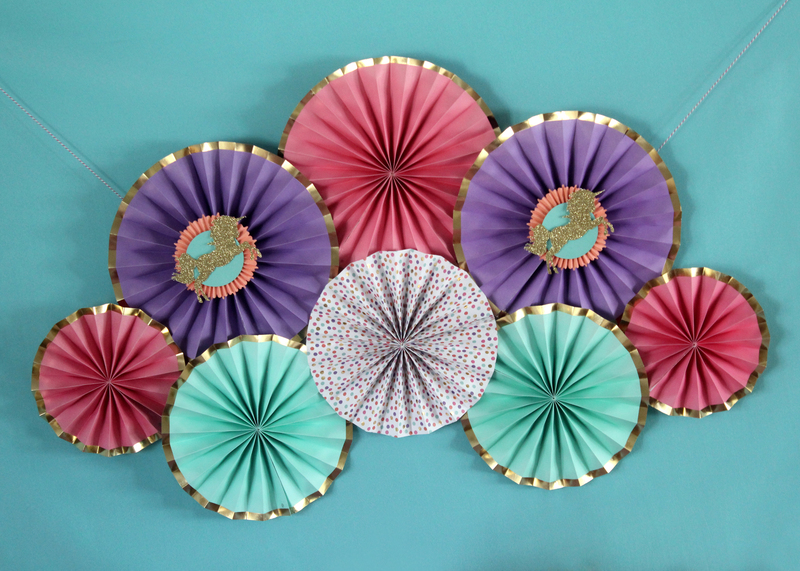 Lay out all the rosettes on a large piece of cardboard. Arrange them how you would like them placed.I used a cardboard presentation board cause it was longer then a normal foam core board. You are creating a strong surface for them to be attached to so you can hang them up as a group. Once you have them arranged trace around them. Cut along that line. You don’t want additional cardboard to be showing outside of your rosettes. 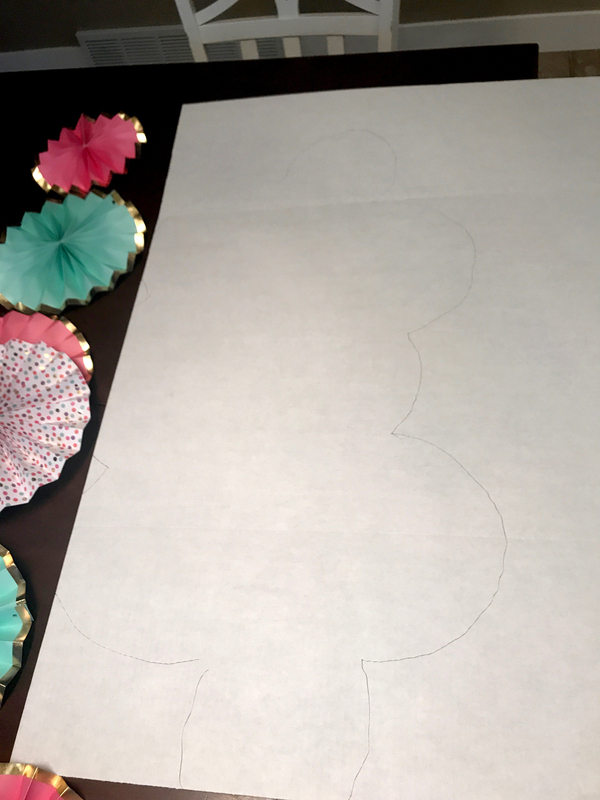 Add 2-3 glue dots on the back of each rosette and place them on the cardboard. Punch a hole on the top corners of the cardboard piece and thread your string through. I used pink and white bakers twine. Tie onto your backdrop and center it!!! 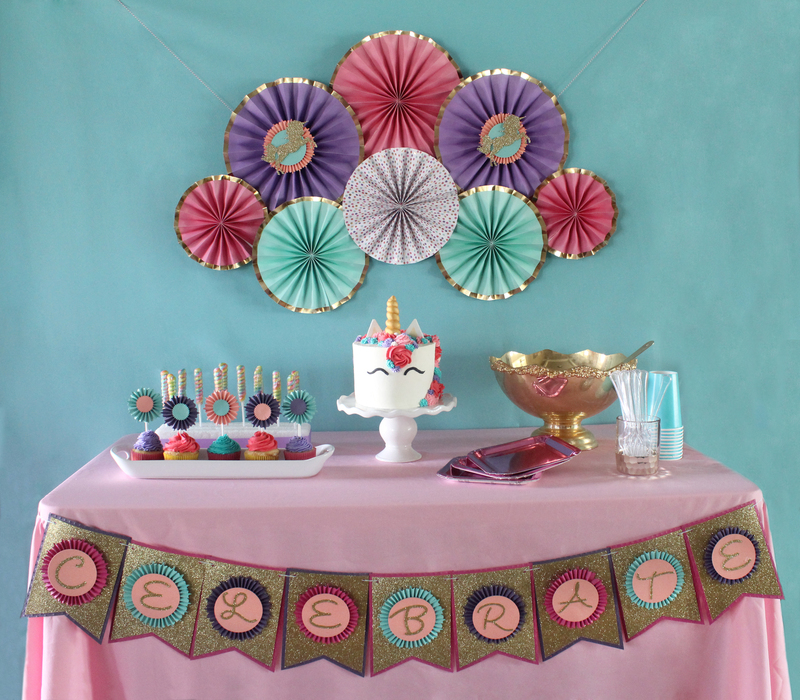 Use the steps for creating the pennants above to create the smaller rosettes with the unicorns. 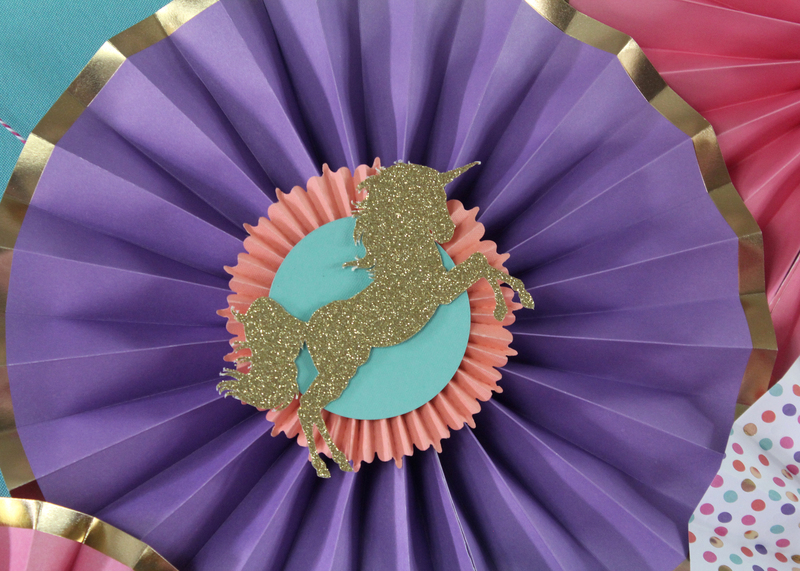 Use this cut file to make the unicorn https://design.cricut.com/#/design/63523757 Cut the unicorn out in gold glitter paper.Use glue dots to attach those to the circles and then attach the circle to rosettes and then to the larger rosettes. You now have a beautiful customized background! This Cake was so much fun to make!! Tutorial coming soon! Check back in my Cake Section to learn how to make this cake yourself!! Thanks so much for stopping by!! Let me know if you have any additional questions or comments about these projects! !